Tomato soup is very popular in India. It is good in winter. This soup is loved by all aged persons. This is a very easy to make recipe at home. It is a very creamy in texture and gives restaurant style test. This is 3 persons serving recipe. 1. Boil tomato, onion and garlic together. 2. Strain water and grind them. 4. Add corn flour in 3 tbs water. Mix them properly and make slurry. 5. Heat butter in a pan; add tomato mixture. 6. Add half glass of water or strained water which is from boiled tomatoes. 7. Add salt, black pepper powder, and corn flour slurry. 8. Boil. Make it thick. 9. 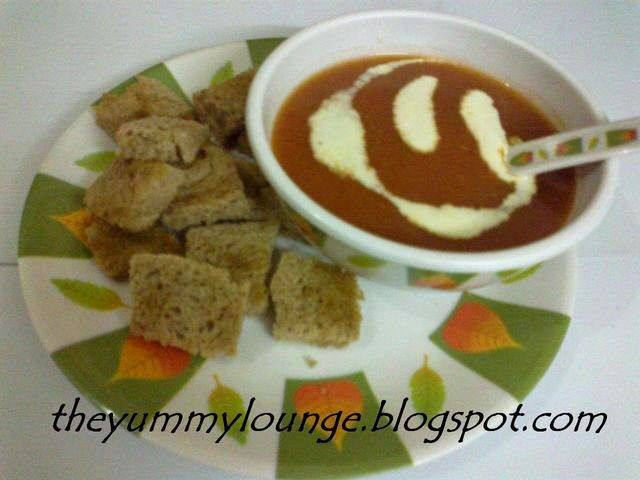 Hot , Yummy and Creamy TOMATO SOUP is ready. Use Fresh cream for garnishing on Tomato Soup. Serve hot with croutons.